A Servlet is a class, which implements the javax.servlet.Servlet interface. However instead of directly implementing the javax.servlet.Servlet interface we extend a class that has implemented the interface like javax.servlet.GenericServlet or javax.servlet.http.HttpServlet. This is how a servlet execution takes place when client (browser) makes a request to the webserver. To write a servlet we need to implement Servlet interface. 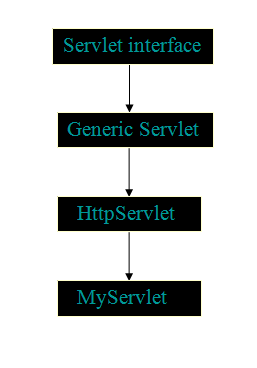 Servlet interface can be implemented directly or indirectly by extending GenericServlet or HttpServlet class. There are 3 methods defined in Servlet interface: init(), service() and destroy(). The first time a servlet is invoked, the init method is called. It is called only once during the lifetime of a servlet. So, we can put all your initialization code here. The Service method is used for handling the client request. As the client request reaches to the container it creates a thread of the servlet object, and request and response object are also created. These request and response object are then passed as parameter to the service method, which then process the client request. The service method in turn calls the doGet or doPost methods (if the user has extended the class from HttpServlet ). 2. webservices in the sense services provided by the server containing servlet container and in that servlet container we have webapplications. And webapplications may contain different servlets in order to retrive dynamic data and also process the data provided by the user. Thank You so much for the answer . This is the best answer i got, because it explained along with diagram and besides that the english is simple, very easy to understand ,,, It helps me alot !